When it comes to braking systems there are a couple of names that always come to mind. Brembo, StopTech, Alcon, and AP Racing. Brembo is most commonly associated with big brake kits or OEM as almost every high performance vehicle now comes with them from the factory. Beyond these 4, there are several other big brake kit upgrades from companies not associated directly with motorsports. But once you cut away the bling and how many pistons you don’t really need, you have brake technology engineering. AP Racing is one of those that is synonomous with racing. They are involved in Formula 1, Rally, Stock Car Racing, street cars, and more. Engineered and built in the United Kingdom, AP Racing’s aftermarket components are extremely popular worldwide and starting to gain steam here in the USA. 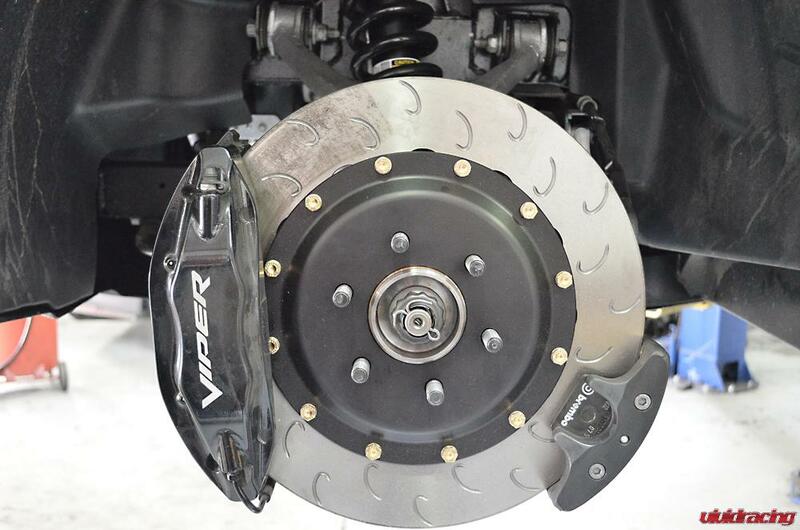 Recently AP Racing sent us a set of their J Hook style rotors to test fit on to our Project SRT Viper. 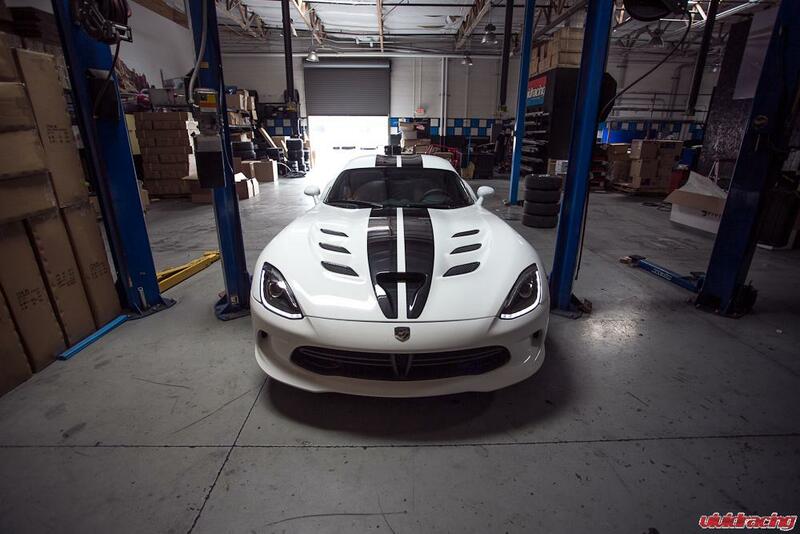 From the factory, the Viper comes with a Brembo caliper setup using a StopTech 2piece rotor. Personally I think this is very weird as if someone were to put a Mustang engine in a Camaro. Beyond opinions, there is probably some serious testing from SRT on this setup. No shortage of braking performance on the SRT Viper, this AP Racing upgrade is purely for that next level of stopping or replacing the OEM when needed. 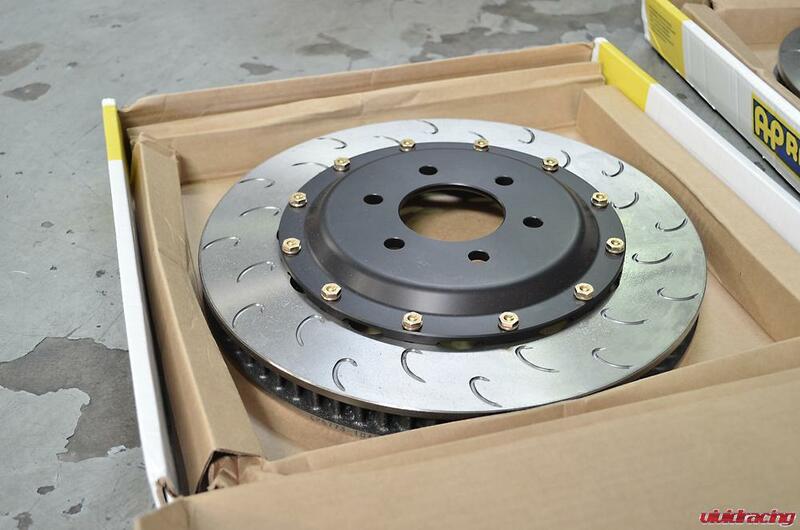 For reference, the stock brakes are a 4 piston caliper front and rear with 14 inch (355mm) slotted rotors. So what is the difference or why change them out? Lets go over the basics… The rotors are both 2 piece with aluminum hats. The AP Racing features their unique J Hook design where the StopTech is a standard slotted rotor. In the racing world, both of these are “technically” better than drilled. 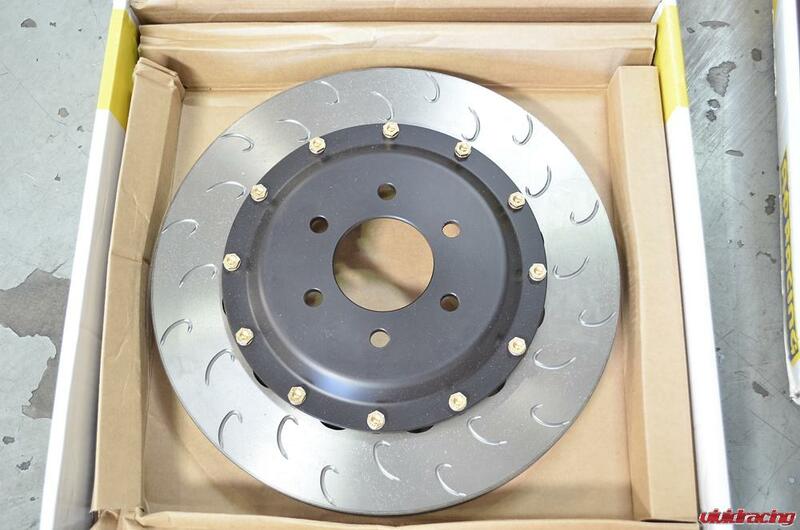 Drilled rotors look better, but under extreme braking use continuously, they can develop cracks. Rotor grooves and cross drilling are used to better allow gases produced to escape. This is also known as heat dissipation. When the face of the rotor is modified, the friction characteristics are changed. Different grooves or patterns will help the braking performance so theorhetically, this really depends on the application or needs. The J Hook design is suppose to give improved bite over slotted. Obviously braking is via friction and brake pad material is used up and can adhere to the rotor surface. The J Hook design is also suppose to give more clearance for debris and reduce vibration or distortion that can commonly happen from over used rotors. These features are enhanced because the J Hook design does not run out towards the rotor end. In addition to the rotor type, another major determining factor is the rotor hardware. This determines if the rotor is a true floating rotor or not. Brembo uses the patented McLaren hardware which features a bearing with a spring to keep a true center line of braking. If you have ever heard a Brembo GTR kit, you will notice that it rattles. This is because in the racing applications, they do not use the bearing but the spring only. Because of this patented application, other companies must use a different design that is up for debate on its longevity. StopTech uses a Belleville Iconel washer and bolt setup. The washers were originally just designed to be a high-heat lock washer. They have a very high spring rate so once they are torqued down they don’t allow the disk to move. Thus making it not a true true floating rotor. When a disk isn’t allowed to expand the hat may crack around the bolt hole area. With a 2 piece rotor, the hat should not become a consumable item. AP Racing uses a common bobbin pin design. The bobbin pin design uses a spring clip that when the hat is bolted to the rotor, gives it resistance to “float” under braking pressure. When you talk about a floating rotor, it is meant that the rotor truely “floats” on the hat. 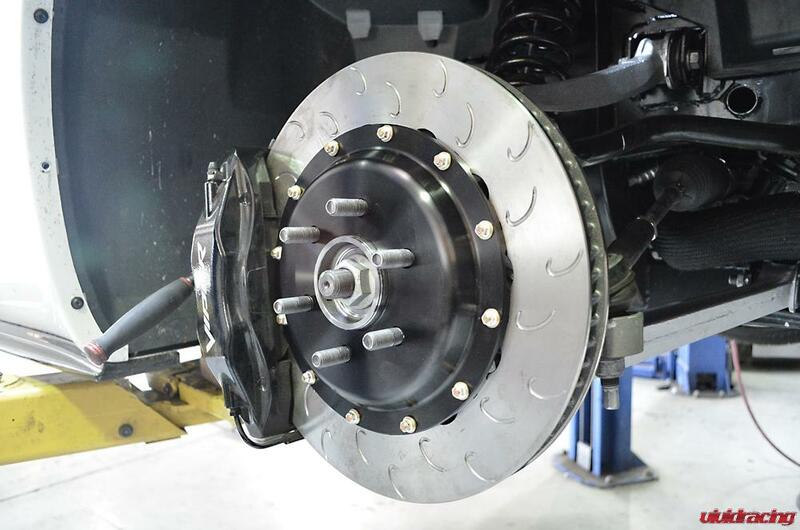 When you brake, the pads are clamping equally on both sides of the rotor to help with pad wear, rotor wear, heat dissipation, and clamping ability. So the end question would be, which would you prefer and why?